Award winning singer, songwriter with honest, confessional, deeply haunting, rich vocals and piano. Music to cry by, to feel what longs to be expressed. 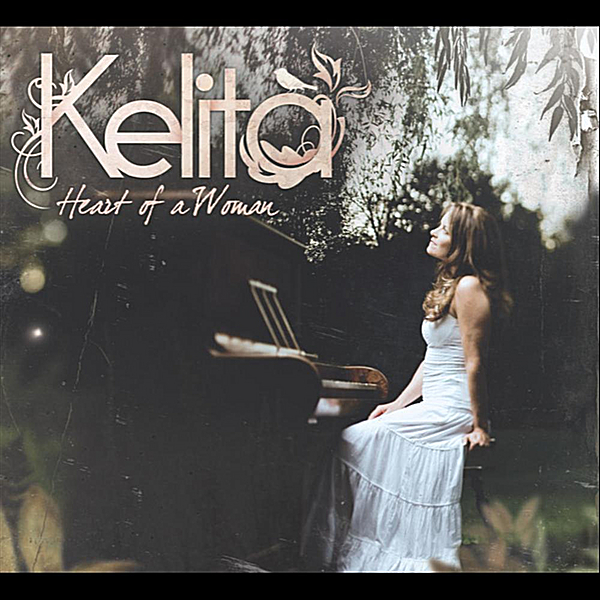 Kelita’s newest CD project simply titled “Heart of a Woman” sees Kelita coming full circle to doing what she does best. That is playing the piano and singing her heartrending songs that reflect her life experiences. She has resurrected some songs that have never been recorded and barely performed live, selected some favorites off of some of her other award winning albums and written new ones that speak about where she is today. Q:You’ve described your new CD as the real you. A:This new CD is the real me! This is the singer, songwriter that’s been waiting to emerge ever since I started writing songs when I was eleven. I feel there have been glimpses over the years but this is the first time my art has been done in its simplest form as a body of work. Me sitting at my piano and singing the songs from top to bottom just the way they were initially written. No big production or intricate arrangements, no background singers, layers of guitars and keyboards fancy solos or modulations. We didn’t use any pitch correction either, which every artist uses today. It’s very pure and simple. I know it’s not perfect and when I listen there are things that I wished I played or sung differently but the feel and rawness of the song was for me and my producer, the utmost of importance. Q:How did you come to make this very simplified CD. A:I have truly wanted to make a CD like this for years but every time I went to make it I ended up doing a fully produced version. My producer and arranger over the past 20 years, who also happens to be my very talented husband, always heard every single instrument on every arrangement of every song. Every time I presented him with a new song I had written his mind went to work. He has done some brilliant work over the years and I have appreciated his musical talents but this time I knew I had to go out on my own. We come from vastly different musical influences and backgrounds so my albums were always heavily influenced by him. Whether it was by adding a bridge, changing the feel or the key of the song, he has played such a huge part. Even though there are a few co-writers on a few of the older tunes, these songs are simply me. I literally have been aching to make this CD so it’s the ultimate accomplish for me and a dream come true. It’s not so much that I couldn’t have made something similar to this but it had as much to do with me taking control of my art and really listening and trusting what my instincts were telling me to do. It was about walking in the confidence I had finally found in myself and trusting that. I know some people may be surprised to hear that about me but deep down inside I am still this person, this artist who is looking for people’s love and approval. “When You Rewrote My Heart|” is actually a song that expresses how I was feeling when I finally had the courage to of my own art and in particular, this project. The song also represents other areas of my life I’ve needed to take ownership of. There’s something very empowering in a woman who at midlife is finding a new confidence in herself. Q:How long has it taken you to develop your own style? A:Coming up with my own style has been an evolution over many years and one that hasn’t come easy. It used to be a huge frustration for me because I was always very versatile. When one is versatile and gifted in many areas it’s often difficult to know exactly what one’s style really is. When you’re young you usually mimick or copy someone. When I started out singing and writing songs my influences were Carole King, James Taylor, Karen Carpenter, Anne Murray. I loved the soft rock folky groups like Seals and Croft, America and Bread. That was the music I could harmonize to, which came very natural to me from a very young age. I gravitated to the ballads – always. I also loved Julie Andrews, Petula Clark and Shirley Bassey, Dottie West and the K-Tel compilations with various artists. So, as you can see my tastes were really varied. After starting out as a singer/songwriter, getting my start in church and in a Christian band in Calgary I then moved to Toronto and studied theatre at York University for four years. I continued the singer/songwriter thing and then did professional theatre, mostly musicals and comedies for a few years before recording my first album which funnily enough was country. Although I grew up listening to country I never wanted to be a country singer. Far from it. Then after many years pursuing the country music business I changed genres and got into the Contemporary Christian scene. I have chosen a few songs like “Deep Dark Secret” and ”In the Shade of the Willow Tree” that were written years ago but never recorded other than a demo. ‘Deep Dark Secret’ is a confessional song that deals with my own childhood sexual abuse. I was inspired to write that song nearly 20 years ago by a minister who told me that I could really help a lot of other women if I were to sing about it. Although I have talked about it I haven’t ever really sung about it. Musically it’s a haunting song and yet the message is ultimately about granting permission to face our secrets head on and experience the freedom in doing that. With stories continuing to come out in the news every day about childhood sexual abuse whether it’s today’s or yesterday’s child, I believe “Deep Dark Secret” will always be a relevant song. Q:How did you record the CD? A:I recorded the whole CD top to bottom in five days out in Vancouver at Whitewater Productions. Roy Salmond was the producer. He and my husband and I had worked on my CD Naked Soul together. That was the last time I was nominated for a Juno. I saw Roy at an industry conference out in Calgary and he asked me when I was going to finally record a CD with just me playing and singing. I was going to produce it myself but when Roy said he would love to do it with me I jumped at the chance. I was happy to work with Roy because he’s a very organic producer who brings the best out of singer/songwriters. I arrived in Vancouver a few days earlier and enjoyed hanging with my cousin, who I was staying with. On the first day we actually chose the songs we would record and then started laying down the first few tracks. It was a pretty intense few days while I was putting down all the songs. I basically played every song with my eyes closed. I didn’t want to have to think about what I was playing. I really wanted to just focus on the emotional and feel of the music and lyric together like a performance in someone’s living room. Intimate. I recorded piano and voice together and we usually did between 2-4 takes and then chose the one we liked the best. However, if I made a mistake I would have to start all over again. I really had to focus. When I finally finished recording all the songs my whole body just crashed and I realized how much energy over the 3 days I had put into the process. After day 3 we then started adding a few overdubs. Stand up bass, some guitar for effect and some string pads. I only sang harmony on one song and that was Bella. Except for a violin player on “Caged Bird” Roy played everything else. I think what he added was simple but effective and that’s what I wanted. We never wanted the production to stand out. This time it was the song and the voice that were front and centre. After the overdubs were done we started mixing and that was it. Preproduction, to mixing – Monday to a Friday and the album was complete. I loved the process and would do it again in a heartbeat. Q:This album is very personal. Is it difficult to expose so much of yourself in your music? A:Well I know it’s personal that’s for sure. No doubt about that. I have been very honest in much of my songwriting over the latter part of my career. Years ago I first sang Unusual Child, written about my ½ brother who died of a heroine overdose experience when I sang in a small club, I think it might have been Timmins Ontario. I was very vulnerable and honest with the intimate crowd and they responded in a way I hadn’t experienced before. I could tell that they really listened and sensed they were really there with me. I wasn’t just churning out music on stage and selling more beer for the club owner. It really opened my eyes and I like the response that I felt in me. However I was only brave enough to reveal half of the story about the song and then a few years after that I was able to tell people that my brother sexually abused me as a young child. I believe one of the first times I shared that in public was when I was in prison… singing that is! It was an all male prison and I was there on behalf of my church at the time. After I was finished singing and speaking an older man approached me before leaving. He said, “I hurt my daughter years ago when she was young and I’ve never been able to really understand her. She’s always been so angry. Now I think I know what I need to do to make things right with her”. Then he shook my hand and thanked me. As he walked away my eyes filled up with tears and I found myself unexpectedly moved by what he had told me. That was a turning point for me and I realized that my honesty could be the catalyst for helping to change a life. As hard as it was at times; especially in the beginning when tears would come at some of the most inopportune times, while in concert, I realized being vulnerable, honest and authentic seemed to be the key in opening up even greater doors for my own healing as well as others.